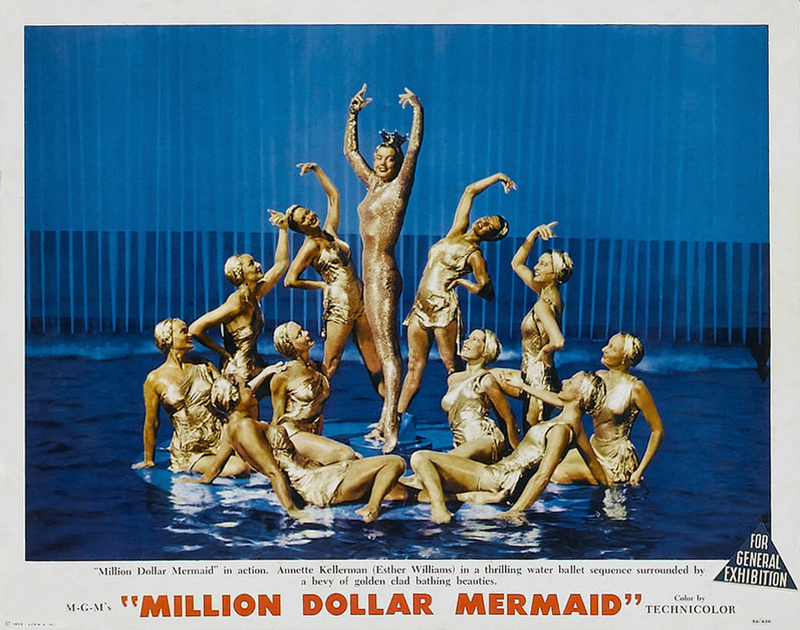 Million Dollar Mermaid (1952), starring Esther Williams, is one of the 1001 classic movies you should see. Each Monday, I'm going to recommend a classic movie you should see (for the reasons behind the 1001 series and reviews of earlier films covered go here). August's theme coincides with TCM's Summer Under the Stars, a month-long film festival that celebrates the talents of some of old Hollywood's most beloved actors with 24 hours of their best movies. 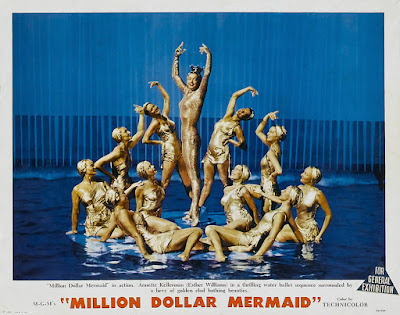 This week's selection is the musical biopic Million Dollar Mermaid starring Aug. 8 honoree Esther Williams. Million Dollar Mermaid is loosely based on the real life story of Annette Kellerman (Williams) an Australian swimming star who pioneered the one-piece bathing suit for women and performed on Broadway and in silent films. The movie follows Kellerman from the time she and her father (Walter Pidgeon) board a ship for England where she meets American promoter James Sullivan (Victor Mature), who begins overseeing her career. The pair eventually fall in love and Sullivan guides her through the ups and downs of her career, which include being arrested in Boston for public indecency while wearing a one-piece bathing suit, her "aquatic ballets" at the Hippodrome theater, and her appearances in silent films. Kellerman was still quite well known in the 1950's, so it was only natural that MGM would acquire the rights to her life story for Williams. She was one of the studio's top stars thanks to her glossy Technicolor musicals that featured elaborate aquatic ballet numbers very much like those Kellerman pioneered in the Hippodrome and silent films. 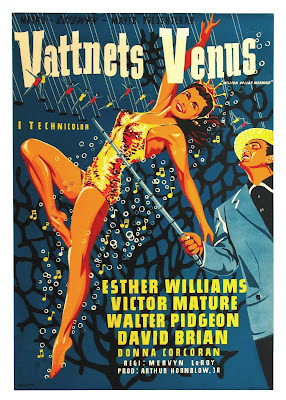 Williams had already scored a hit with a remake of Kellerman's silent film Neptune's Daughter (1949), and MGM made sure that Million Dollar Mermaid was another blockbuster by giving the movie a top director in Mervyn LeRoy, a popular leading man in Mature, and plenty of spectacular, budget-busting aquatic ballets choreographed by the legendary Busby Berkeley. Today, Million Dollar Mermaid is probably Williams' best-known film. She titled her autobiography The Million Dollar Mermaid, and the Hippodrome aquatic ballet has been endlessly imitated and parodied ever since. 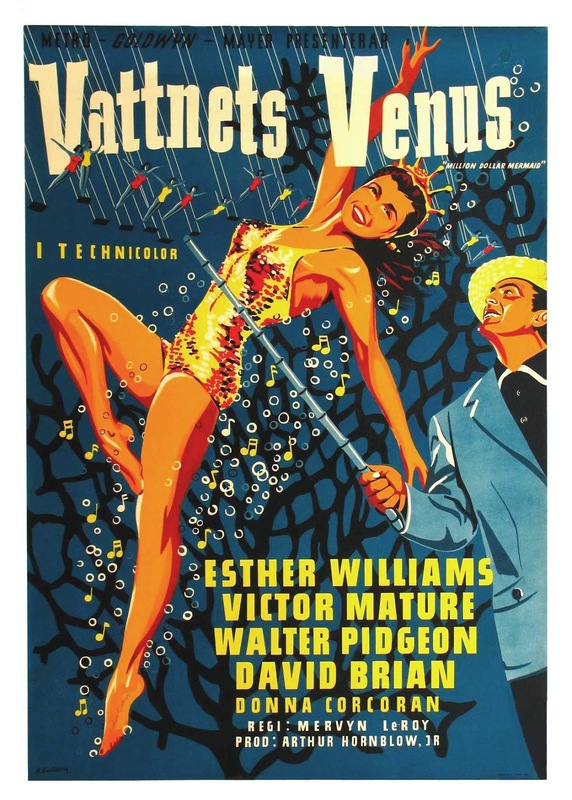 Although Williams doesn't try to do much acting as Kellerman -- in fairness, she was never trained as an actress; Williams would have probably been an Olympic champion swimmer if the outbreak of World War II hadn't cancelled the 1940 games -- but the movie exemplifies the best parts of Esther Williams, the movie star. She looks sensational in her many one-piece bathing suits, not to mention the gold-lame body suit, and she shows off her superior athleticism in the aquatic ballet numbers. 1. Kellerman. Kellerman was reportedly displeased with Million Dollar Mermaid. She thought Williams was too pretty to play her (I actually think they look a good deal alike), and the movie changed the personality of her husband and manager from a shy, dignified man to that of a cheerful huckster. 2. Hippodrome scene. There's nothing in all of cinema quite like the aquatic ballets in Million Dollar Mermaid. Berkeley, who was known for his spectacular, but rigidly geometric choreography in films like 42nd Street (1933), pulls out all the stops for a colored smoke and sparkler filled feast for the eyes that features the ever-game Williams elegantly gliding down a 40-foot water slide and being dropped from 50 feet in the air into a pool filled with swimmers in a Ferris wheel pattern. 3. Synchronized swimming. Once you get past the bedazzled swimsuits, it's easy to recognize that Williams was one of the greatest athletes ever to appear on film. Her aquatic ballets inspired the sport of synchronized swimming, and her toned body and fearless demeanor are a great role models for young women. 4. 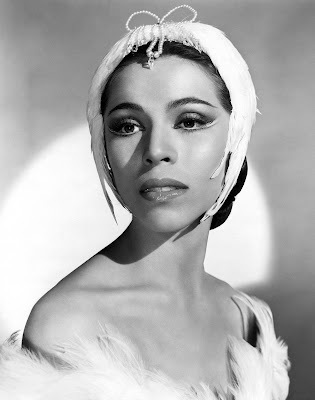 Maria Tallchief. The ballet star has a brief cameo recreating legendary ballerina Anna Pavlova's performances at the Hippodrome. Other critics: Million Dollar Mermaid has a 68 percent fresh rating at Rotten Tomatoes, and Leonard Maltin calls the film "OK" in a two and 1\2 star review for his Classic Movie Guide. Critics in 1952 liked the aquatic ballets, but were rather skeptical about the rest of the film. The New York Times critic Bosley Crowther praised the "elegant Miss Williams" in the Hippodrome number, but heaped scorn on the rest of the movie, writing that "this Technicolored shindig, which laughingly pretends to be a biography of the famous swimmer, Annette Kellerman, is a luxuriance of razzle-dazzle that includes Hippodrome acts, water ballets, bathing suit shows, diving performances, low comedy, anachronisms and clichés. It also includes an abundance of Miss Williams and Victor Mature, but it does not include the felicities of a reasonably fascinating script." Maria Tallchief as Anna Pavlova in Million Dollar Mermaid (1952). The bottom line: Million Dollar Mermaid has its failings, including the cliched script and flat performances, but the aquatic ballets in glorious Technicolor and Williams' athleticism are a truly wonderful sight to behold. Availability: Million Dollar Mermaid will air at 10 p.m. Monday (8-8) as part of the Summer Under the Stars celebration of Esther Williams. The film is also available on DVD. Next week, I'll continue the Summer Under the Stars theme with director John Ford's masterpiece, How Green Was My Valley (1941) starring Roddy McDowall.